This is a weekly list of Free Homeschool Curriculum and Resources compiled by Carrie from . 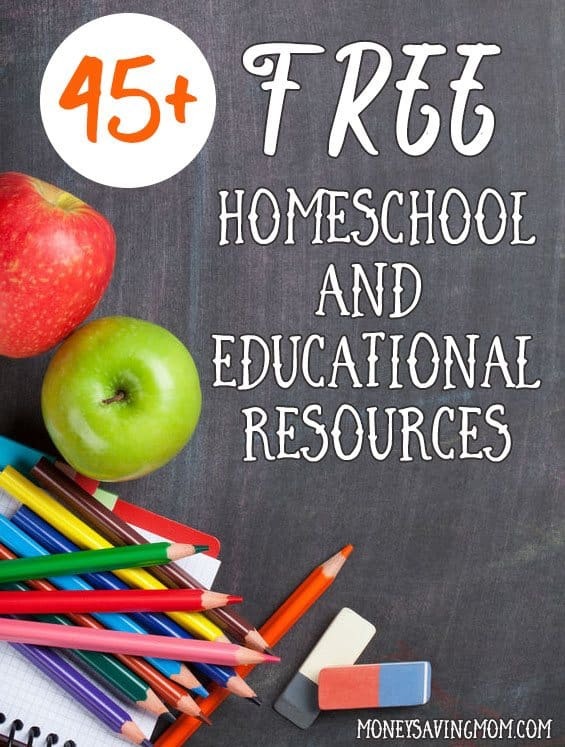 If you aren’t a homeschooler, but you’re a parent, teacher, babysitter, or nanny, you’ll probably find at least a few useful freebies in this list. You may also want to go through the Educational Deals and Freebies from earlier this week for more. – This is a great tool that you can use for reading comprehension, book report preparation, or even book clubs! – The free spelling lessons cover academic subjects taught at particular grade levels. – This Daily Grammar Archive gives lots of options and covers simple, yet meaningful grammar lessons. – I absolutely LOVE how history is woven into this curriculum by studying old newspaper articles and people from the past. .
– Fill your child’s Kindle with these free and cheap chapter books! They’re perfect for read-alouds and independent reading. – Creative writing influences critical thinking skills and forces a learner to think outside the box. Get ideas and access to free writing templates and writing promts. – Although we have Google, Siri, Alexa, etc. at the tip of our fingertips when we need to know any tidbit of information, it is still important to teach our children dictionary skills. It is becoming a thing of the past like cursive and the Dewey Decimal Classification System used at libraries. Getr this FREE Dictionary Skills Printable Pack for use in your homeschool or co-op. – Help your child to understand working with long vowels with this free, printable pack. – Using copywork with upper grades is a great way to not only work on their handwriting skills, but also reinforce a book or poem they have been reading and learning. In All You Do has gathered 25 quotes from “The Hobbit” by J.R.R. Tolkien, perfect for Middle and High School. – This “How To” guide on studying Native Americans is help for a fun history unit study in your homeschool. – FREE Printables and Resources for studying the 50 States! New States added weekly. – If you are studying the Ancients this year you will love these coloring pages. – Here are some great geography lessons of North America for kids to learn more about their world. This set includes some printable fact cards about North America. – Learn about seven featured landmarks in this notebooking set. – This FREE National Symbols Coloring Book is perfect for any study on the United States. – This series presents history chronologically in an adventurous way that will keep children captivated. – Students learn about their own community with these free geography printables. – Study 13 famous composers! Includes a blank form to fill in when studying additional composers. All notebooking pages are black and white to save you ink and include portraits. – Help your children connect with historical, post-impressionism artists and their famous works of art! – Is your child fascinated by horses? Are your children intrigued about the mystery and beauty of horses? If so, this site compiles the very best horse books for kids. – These unit study planning sheets will be so helpful in creating your own unit studies. – You can help your children to memorize Bible verses with these free, printable Bible verse memorization cards. This pack of 10 cards is colorful and kid-friendly! – Make Bible reading and having a quiet time easy on yourself with this very beautiful Learning to Love Bible Study. It’s a four-week study and you will find each day’s study to be spiritually nourishing. – These 21 fun and free Bible verse games include awesome tips on how to use art and music to help children memorize Bible verses. – This is a GREAT, free Bible study for adults and possibly teens. – You can display your heart of gratitude with The Thanksgiving Jar. It will help you and your children create and foster an attitude of thanksgiving! The free printables are beautiful and will challenge you to find the blessing in every little thing! – Looking for meaningful passages for your child to practice copywork with? Look no further! – Need a little encouragement? Tthis collection of inspiration and wisdom printable images are completely free! – This freebie includes printable 3-part cards and a bird watching chart. – This adorable board game is geared towards girls and incorporates STEM style learning activities. – Whether or not you love the idea of science dissection, you may not be able to do a real life one, and these resources are for you! – Tons of GREAT FREE resources to use when studying trees. – In this FREE science curriculum your student(s) will get an introduction to the science of space! Get an overview of the Universe and learn about moons, planets, stars, systems, galaxies, and more in this FREE online science curriculum! – Here are over 200 free printables for preschool and kindergarten-aged children. Not only are they free, but they are so individually creative! – Get lots of FREE printables and ideas for your early readers! – This fun 18-page printable is themed around animals of the frozen lands! These would be great to use with an arctic animal unit study, or a habitat unit study. – This free printable pack will help your children with lines and strokes and important prewriting skills. – Learning about detectives can be a fun unit study to do with your little ones as they can pretend to be detectives, and search for their own clues to solve mysteries. – Whether you live in a big city or country village, upit young learners will have fun with this Kindergarten/PreK/1st FREE farm animal ABC search. – Young readers that love ocean animals will love this little book! You print the pages and your child will color, staple, and read them! It’s a simple activity, but one that your child will enjoy. – ABCmouse.com Early Learning Academy is a subscription-based digital education program for children ages 2–8. Try it FREE! – You can start recording, or organizing, your homeschoolers grades with this FREE homeschool gradebook. – Paint a stunning floral still life with ease in this FREE class! Teens learn how to bring color, composition and technique together to create an acrylic masterpiece. – Nature study doesn’t have to stop when your children are teens. Teens can still enjoy learning about nature, doing nature study and enjoying the great outdoors. Find out some fun and interesting ways to include your teens in Nature Studies here. – Wondering if you can homeschool your children all the way through high school? Here are some great reasons to keep running the race. – One of the biggest concerns I have seen in the homeschooling community in the older years is the concern over grading assignments. This is where grading rubrics and assessments can come in handy! – Let’s be honest here…we all live in homes that could use a little decluttering. – The Homeschool Teaching Summit, October 16-21, will bring you exclusive, Christ-centered encouragement, parenting help, and life-balance guidance from 25 top speakers—all for absolutely free, available anywhere online. – The Homeschool Teaching Summit, October 16-21, will bring you exclusive, Christ-centered parenting, encouragement, and life-balance guidance from 25 top speakers—all for absolutely free, available anywhere online. – If you’re short on funds, you’ve got to spend your money more meticulously than ever. The items on this list are beautiful, whole-food items that can be found at affordable prices. – Heading to the local coffee house is an expensive habit. One trip for two hot drinks can run you close to $10! Learn how to make your fave coffee drinks at home. – Get tips and fabulous ideas on how to accomplish your household chores when you have little time. – Earn $2,000 a month teaching English online in 3-5 hours a day. – Do you ever get discouraged when you see the humongous rooms that some families are able to dedicate as a homeschool classroom? Let me let you in on a little secret: they’re overrated. Unless you have a large family, a separate classroom is not a necessity. Check out how one mom homeschools her children in a small space! – I literally have had about 5 ice cube trays stored in cabinets… just collecting dust. I had no need for them anymore. That is why I am so glad to find ways to use ice cube trays. They are actually truly, totally brilliant. – If you’re ready to pick up your yarn and hooks, fill your Kindle with these free and cheap crochet books. – Are you looking for some creative and inexpensive ways to decorate your home for Fall? Carrie has been homeschooling for over a decade and loves to share FREE homeschooling resources, deals, and reviews over at . You can find , , , , and much more. « Walmart: Noxzema Razors just $0.58! Наш популярный веб сайт , он рассказывает про Нандролон Фенилпропионат .